This movie actually had been shown in US theaters two months ago but only premiered in Indonesian theaters on 25 September. Yes, I was a bit late seeing this one as I was occupied in the last couple of weeks. In fact, I almost thought that I would not be able to see this one in the theater. But as so happened, there was no new movie that intrigued me yesterday and while looking at the Cinema 21 website, it appeared that this film was still playing in 3 theaters. One of them was in my wife's favorite mall at Lotte Avenue. So we decided to see the movie at 7.15 PM, but prior to that, my wife managed to see The Foreigner first. Good for her! Anyway, we shall now concentrate on the movie. 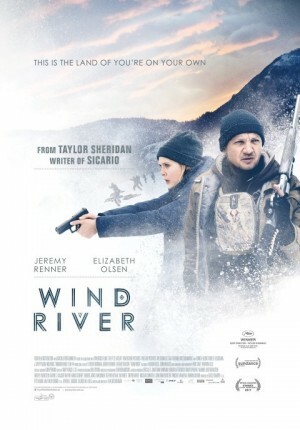 A US Fish and Wildlife Service Tracker named Cory (Jeremy Renner - Hawkeye in Marvel Cinematic Universe, Arrival etc) was tracking some wild animals in an Indian Reservation called Wind River when he found a body of a teenage girl named Natalie (Kelsey Chow). He noticed that the body had been there for quite some time and there was blood which suggested foul play. He requested the assistance of police chief Ben (Graham Greene - Dances With Wolves, The Green Mile etc) who then asked the help from FBI. A rookie agent named Jane Banner (Elizabeth Olsen - Scarlet Witch in Marvel Cinematic Universe, Silent House, Godzilla etc) was assigned to Wind River as she was the agent nearest to the location. Due to the snow storm happening and the wide areas, Banner requested the assistance from Cory on the investigation. Cory's expertise in hunting and knowledge of the location was truly a great asset to support Banner. Plus the fact that Cory also knew the victim's father Martin (Gil Birmingham - Hell or High Water, The Twilight Saga series etc) and wanted to help him find out the culprit. Their investigation would lead them towards few possibilities. So what actually happened to Natalie? Why was she found all alone so far away from any places? Find them all in this murder mystery drama movie. I have never seen any of this movie's trailer and was interested in seeing it due to its brief synopsis that suggested a murder mystery to be solved in a remote location. So when I saw the movie, I already can guess from the first 10 minutes that this would be a slow pace movie focusing on the investigation. The good thing about knowing what to expect was that I could still enjoy the movie despite it having a lot of dramatic moments and not a lot of actions and just focus on the story. Talking about the story, it was a good one. The mystery was not that spectacular and having lots of twists, but I think there was a message that the writer/director/producer wanted to share in this movie, which was about the lives of people in the Indian reservation place which did not seemed to garner the attentions from US government despite them being the native Americans. I understand that was the reason why the movie was told to be inspired by true events. I personally loved it when there were some fight scenes in the middle and of course the climax. The sound effects for this kind of movie was surprisingly very good. The gun shooting sounds were amazing and truly gave the effect of being in open space and heard the echoing sound. While the actual location of Wyoming also gave us an idea of such a tough location to live. The film also marked the first time Jeremy Renner and Elizabeth Olsen played in the same movie apart from Marvel's movies. There was one particular scene before the climax part that I truly loved as it was kind of a surprise but at the same time it also made my wife and I felt sad (you would know what I mean when you see this movie). Oh ya, this movie definitely not suitable for young children as there were violent scenes that better be watched only by adults. It was a surprise for me and my wife when we saw a couple with their very small baby in the cinema (with their baby troller put in the corner of the theater). In the end, this movie was a good quality movie in term of story. But people who expect to see lots of shoot out and fighting scenes would not be able to enjoy the film. The movie was having a serious tone with morale message and few dramatic moments which would not be too suitable for audience looking for thrills of an action movie. However, if you are looking for a murder mystery drama movie, this one definitely worth to see. Though you probably have to wait for it to play in cable TV or once it is available through online streaming as it is only playing in few cinemas in Indonesia and most likely disappear in next week or so.